No matter how complex or nuanced your strategy, Actant ExStream makes it quick and simple to implement, powered by Actant’s easy to use scripting and ExStream Studio. Filter, scan, manage orders on all instruments, create smart order types and execution algorithms. Visualize, customize and automate position, risk management and hedging. Actant ExStream allows users to filter, scan, and manage orders on all options and complex orders in the application. With a simple language and intuitive interface, ExStream scanners empower the trader to create sophisticated strategy implementations without the use of developers and with minimal concept-to-production time. These user-defined smart orders enable users to create algorithms tailored to their trading style without reliance on outside vendors and the associated fees. Iceberg, contingent, layered, market joining or fully featured spread algos are all easily created by Actant users for immediate deployment. 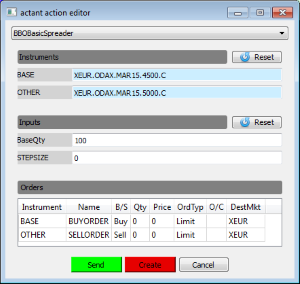 Managing risk is important and Actant provides auto-hedging functionality right out of the box. Whether you want to hedge individual trades or your entire portfolio with static or dynamic order management, Actant’s products provide an easy to use mechanism allowing you to take advantage of underlying or options markets to lock in edge and control your risk. Managing risk is important and Actant provides customizable columns so you can see risk the way you want to see it. Using the same optimized script language, flex columns provide a proprietary way to create and view risk metrics. More than that, Flex Columns provide a useful way to create market barometers, valuation status, and even opportunity identification. With Actant Flex Columns, the user can gain insight into market forces and enhance workflow efficiency. Actant scripting provides instant results. Traders and developers creatively leverage all the strengths of the Actant scripting to build proprietary algos at a tiny fraction of the cost of traditional programming languages. 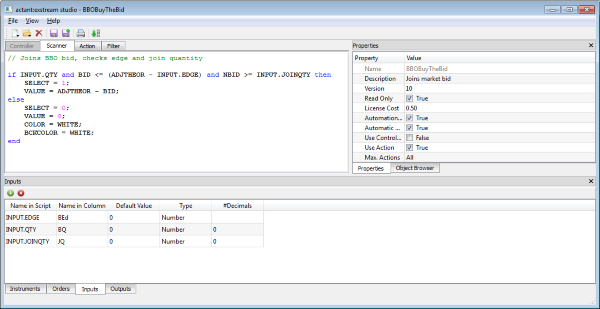 Actant ExStream Studio interface is a clean, intuitive workspace for Actant users to quickly and easily create custom algos. Users have access to market, valuation, and risk data in addition to all the available instruments on their Actant.